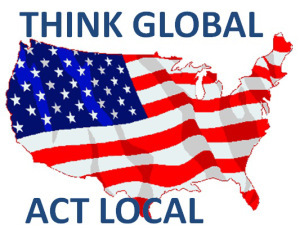 Think Global / Act Local and Impeach Obama | Stop Obama Now!! This slogan has been around for a long time, but is most often remembered as a bumper sticker on the Volkswagen vans of hippies in the 1960’s and 70’s and as a slogan used by Progressives and environmentalists. Just because they used it, though, does not make the concept invalid. The slogan is just a mandate to think about the big picture but act in your local area with like-minded people that you know personally. Many wonder why the impeach-Obama effort has had a difficult time gaining traction while Obama is so blatantly anti-American. There are a number of impeach-Obama and anti-Obama Facebook groups with around 100k likes or more each. There are probably several hundred thousand intensely anti-Obama users on Facebook, mostly waiting for a national conservative “messiah” to save them, who will never come. Harvey Milk Stamped “Out” Forever ! Global gaydom was even predicted by Jesus (see “days of Lot” in Luke 17 and compare with Genesis 19). And the Hebrew prophet Zechariah (14th chapter) says that during the same end-time gay “days” ALL nations will come against Israel and fulfill the “days of Noah” at the same time (see Luke 17 again) – a short time of anti-Jewish genocide found in Zechariah 13:8 when two-thirds of all Jews will die. The same “days” will cause worldwide human government to collapse in just a few short years! For the first time ever there won’t be enough time for anyone to attend college, have a family, enjoy retirement, etc. It will also be the last time anyone like ObabaBlackSheep will be able to keep pulling the wool over our eyes!